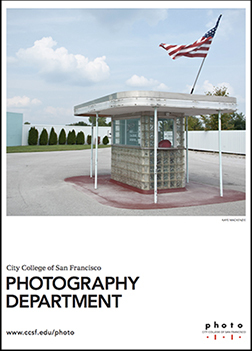 The City College of San Francisco's Photography Department is one of the oldest and largest programs in the country founded in 1935. We offer degrees and certificates and a broad selection of classes including but not limited to Digital Photography & Imaging, History and Aesthetics of Photography, Advanced B&W Darkroom Techniques, Advanced Studio Lighting, Mixed Media Processes and Business Practices of Photography. Our faculty and staff consist of experienced professionals who create an environment that encourages creativity, technical aptitude and critical thinking. Whether your interest is as a commercial photographer, fine artist or enthusiast, we will provide the means and guidance that will help you achieve your goals. Follow us on Facebook, Instagram or Wordpress. Join our email list. The Program is designed so that students may satisfy the requirements of graduation from the College. Students who satisfy these requirements receive the major in Photography if they complete the program of study with a B minus (2.75 grade-point average) or higher. The program adviser of the Photography Department will help students who desire to plan special programs of study. We offer a number of certificates of accomplishment in photography. Currently enrolled students as well as past students may apply for them. Simply stated, articulation deals with how courses transfer from one college to another. Specifically, articulation is the process of establishing which courses offered at City College of San Francisco (CCSF) are comparable to, or acceptable in lieu of, courses offered at four year colleges and universities. Many of our students transfer successfully to both public and private colleges from our program, most entering in as Juniors. • Use the traditional tools and techniques of photography. • Develop skills in digital technologies. • Apply concepts and aesthetics to create and evaluate photographic images. • Satisfy academic transfer requirements to institutions of higher learning.